VINEYARD AND ESTABLISHED FRUIT TREES INCLUDING AVOCADO TREE, TANGERINES, PERSIMMON, FIGS, ORANGES AND OLIVE TREES AMONGST OTHERS. This spacious and superbly located property is structurally sound and it only requires a few changes on the lay-out of the ground and first floor to be converted into a more contemporary rural family home. The house has plenty ready to use external rooms including a large cellar with wine Barrels, wine making press tank, vegetable & fruit storage areas and animal quarters. The house is perfect for anyone looking at starting a farm life or even suitable as a small permaculture farm. The house uses a borehole for water supply but has mains water ready to be connected to, it’s connected to mains electricity, currently uses a septic tank for sewage, other utilities such as internet and telephone network are available for connection. The Ground floor as an excellent size open plan kitchen / dining room which also has a bedroom to one side and on the other side leads on to an area recently rendered which has a room with wine making press’s and tanks which in turn gives access to a bathroom and a large space with another storage room (this area could potentially be converted adding 2 bedrooms to the property) there’s a small staircase in concrete that leads from the kitchen to the upstairs living quarters. The first floor has the main entrance door at a higher level leading from the road which leads to the main hallway in the house and provides access to 4 regular size bedrooms, 1 good size bathroom, one small support kitchen with a fire place in the landing room coming down from the attic which also gives access to the southeast facing veranda with great views. At the end of the hallway there’s a staircase which leads downstairs to the small support kitchen described above. The first floor wooden windows are single glazed, the flooring in the bedrooms is wood parket flooring, and the rest of the house in the bathroom and downstairs is tiled. The large attic currently has a water tank filled from the borehole which is used to gravity feed the house, this could be easily removed to convert the entire space into further living space with the best views from the house. The farm land is very fertile, has a fully established wine producing vineyard, and a large orchard with a wide range of fruit trees, there are 2 wells and a tank used for irrigation. The property is around 5km away from the Municipality of Ferreira do Zêzere which has all the basic amenities, such as Pharmacy, Medical centre, banks, restaurants, cafes, schools nurseries etc. 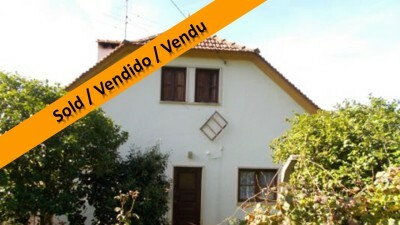 The property is easily accessed from the A13 motorway and seats at the edge of the small village of Pias and Areias. The location is also only a mere 18km away from the village of Dornes and very close to other places of extreme natural beauty and river beaches. The historic town of Tomar, which is home to the UNESCO listed Convento do Cristo, is only 20 minutes drive from the property. All major european high street shopping is also available in city of Coimbra the 3rd biggest city in Portugal which is only 50 minutes drive on the A13 motorway. The closest airport to the property is situated at Lisbon, which is approximately one and half hours’ by car.